To fetch a fantabulous performance, opt for Asus M Series Desktop PC. It?s ideally designed for the lifestyle of business class users as it comes with Windows 7 Professional 64-Bit OS. It?s also clubbed in with an Intel Core i5 3.40 GHz processor, 500 GB SATA HDD with a speed of 7,200RPM, and memory of 4GB DDR3 RAM having a speed of 1600MHz. With one PS/2 connector, one LAN port, and 8 USB ports that support 2.0 and 3.0 data transfer, an HDMI and VGA port is provided to view high definition visuals giving you high scale entertainment. It has an integrated HD audio and video that gives you an excellent sound reception. With an integrated RJ-45 Ethernet LAN card having a speed up to 1000Mbps allows you to download the data at lightning pace. It has connections provided for USB Mouse and Keyboard. It also contains media reader that supports media types like MMC, xD, SD, etc. 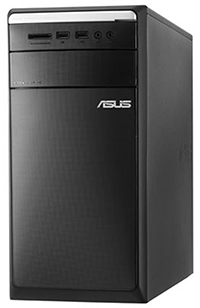 Order the Asus M Series Desktop PC today! 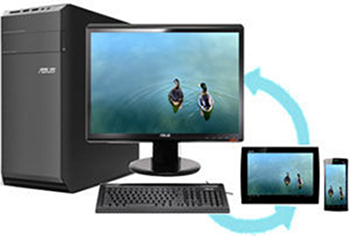 Accomplish more tasks with greater efficiency when you have the Asus M Series Desktop PC. It features impressive technology developed to provide a superior computing performance. With it's elegant design, easy to access front I/O ports and cleverly-hidden ODD bay, the M11AA complements your style. It is powered by a 3rd generation Intel� Core? processor, and features ASUS Exclusive SonicMaster technology that delivers improved audio clarity, louder volumes, and more detailed sound. and Full HD 1080p video playback for an immersive multimedia experience. ASUS computers reflect a tradition of the finest quality, innovation and longevity. Based on the PCWorld USA 2012 reader survey of tech satisfaction, reliability, and service, users ranked ASUS as a leading choice for desktop PCs, citing high satisfaction with their value, connectivity, ease of use and reliability. The survey also found ASUS desktop PCs were one of the most likely to be recommended to others. Powered by the 3rd generation Intel® Core™ processor, the M11AA features Intel® Turbo Boost Technology 2.0 that enables processor cores to run faster than the base operating frequency. The Integrated Intel® GMA provides high definition graphics and a high-quality video playback experience to answer all your entertainment needs. M11AA features ASUS SonicMaster technology an audio-optimizing technology developed by the ASUS Golden Ear team. It features a host of innovations that delivers improved audio clarity and details, optimizing sound quality of all your music, videos, and movies. The ASUS M11AA is supported by Ai Charger which offers 50% faster charging speeds for all USB-compatible devices. With Full HD 1080p support, you can immerse yourself in a cinematic experience and enter a spectacular world of colors by connecting to a HD monitor or TV with the HDMI™ port. integrates several ASUS management utilities together to allow users to manage parameters like energy settings, fan speeds, and voltage to sensor readings. Share your pictures, music and movies with 32GB* free space for 3 years, wirelessly share your files across multiple devices. With a keyword search, you can find the relevant files in no time. Record and upload the important meeting notes with snap shots, and then access them on any devices. Experience lightning speed data transfers at 4.8Gbps with USB 3.0 - the latest standard. USB 3.0 transfers data up to 10X faster than USB 2.0 while remaining fully backward-compatible. This high-speed transfer rate significantly reduces data transfer times even for large files like videos and photos, meaning you spend less time waiting and more focusing on the task on hand. SATA 6.0Gbps ports offering twice the delivery throughput of regular SATA and delivers improved scalability, so your data moves faster and more reliably. The ASUS-exclusive EPU chip is the world's first PC energy saving controller, optimizing efficiency by detecting real time CPU loads and saving up to 40% on overall power consumption. ASUS-exclusive Instant On enables 98% power savings in Eco Mode and effortlessly resumes your applications to exactly where you left them with one hot key. It also keeps your data extra secure on hard drive, safe from power outages and accidental deletion. *Simply press Alt + F1 to enter Eco mode and press any key to resume. ASUS' exclusive Smart Cooling System and Q-Fan lower operation temperatures by up to 11.4C and adjust CPU fan speed according to system loading, enabling M11AD to power through any intensive task and possesses utmost quality: stable, quiet and efficient. High-quality components provide utmost durability, improved longevity and enhanced thermal performance thanks to top-quality solid conductive polymer capacitors. Dimensions (H x W x D) 14.2" x 6.8" x 15.8"